Millennials in the United States are weaker than their international peers when it comes to skills in literacy, numeracy and problem solving in technology-rich environments (PS-TRE) — despite having the highest levels of educational attainment of any previous generation, according to a new study from Educational Testing Service. 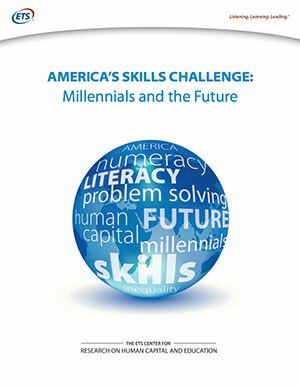 "America's Skills Challenge: Millennials and the Future" used data from the Programme for the International Assessment of Adult Competencies (PIAAC) to compare young adults (ages 16-34) in the U.S. to their counterparts in other member countries in the Organisation for Economic Cooperation and Development (OECD). The age group was selected because "these young adults are the most recent product of our educational systems. They have also attained the most years of schooling of any cohort in American history. And, these millennials will shape the economic and social landscape of our country for many years to come," according to the researchers. Across all the skills assessed, U.S. millennials' average scores were lower than the scores in 15 out of 22 other countries; Americans ranked at the bottom in numeracy and PS-TRE. Even the top-scoring U.S. millennials (those at the 90th percentile) — typically those with the highest degree of educational attainment — scored lower than top-scoring millennials in most other countries. "While it is true that, on average, the more years of schooling one completes, the more skills one acquires, this report suggests that far too many are graduating high school and completing postsecondary educational programs without receiving adequate skills," wrote Irwin Kirsch, director of ETS's Center for Global Assessment. "If we expect to have a better educated population and a more competitive workforce, policymakers and other stakeholders will need to shift the conversation from one of educational attainment to one that acknowledges the growing importance of skills." The full report is available at the ETS site.